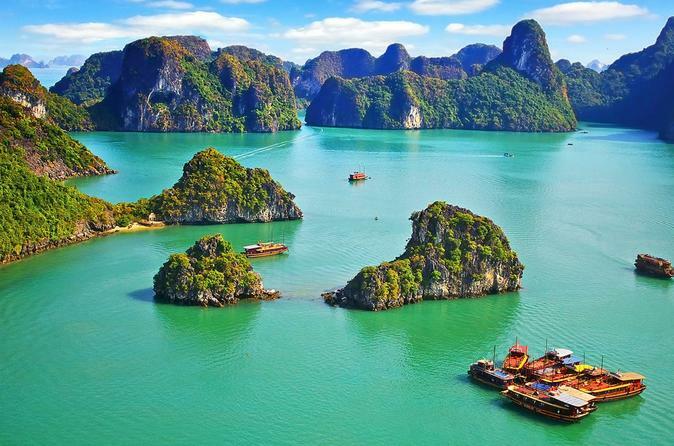 Imagine waking up surrounded by the tranquil beauty of Halong Bay, one of Vietnam's most spectacular natural wonders. Explore the UNESCO World Heritage-listed bay, dotted with impressive limestone islands, on a two-day cruise aboard a traditional junk boat. You’ll enjoy a guided tour of the limestone Cave of Surprises as well as free time to sunbathe, swim and kayak in secluded lagoons. Receive personalized service from your crew on this small-group tour, limited to 24 people. 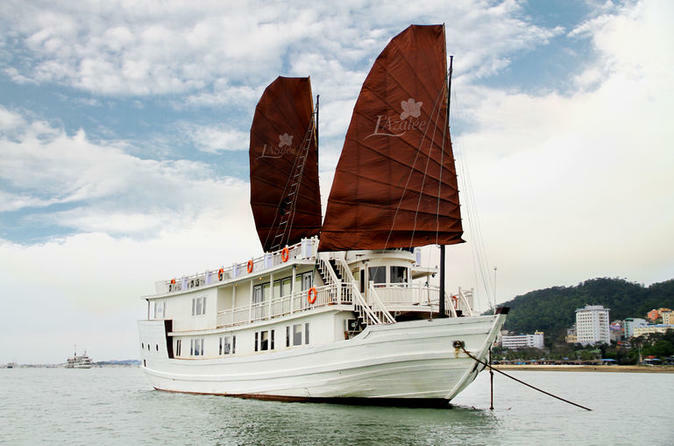 Take in the sights of UNESCO World Heritage-listed Halong Bay on a 2-day luxury cruise aboard a traditional junk. Swim in the bay’s emerald-green waters and kayak around its limestone karsts such as Cave of Surprises and Drum Cave, or just relax on board with a friendly and professional crew. You’ll see plenty of natural wonders from the boat and visit a few island villages for a glimpse of local life. Enjoy a cooking class, a tai chi lesson, films and several seafood meals on board, including deluxe accommodations in ensuite cabins. 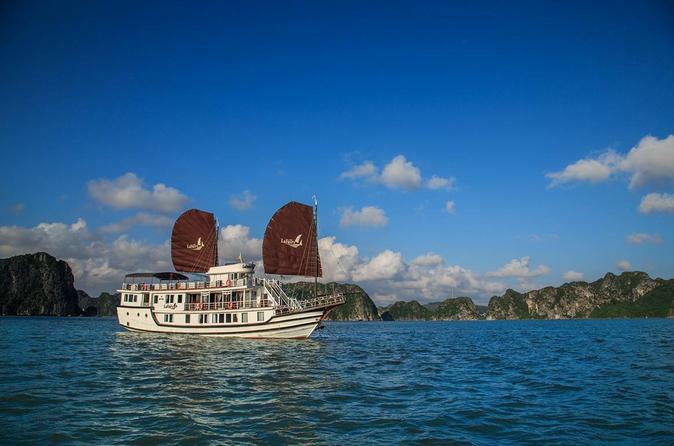 Enjoy more time exploring Vietnam's Halong Bay, one of Vietnam's most spectacular World Heritage listed natural wonders, on this 2-night cruise aboard a junk boat. Dotted with limestone islands in a sea of azure blue water you will cruise the bay, enjoy seafood lunches, dinner, swimming, kayaking (optional) and visit one of the many limestone caves. Our 3-star cruise boasts international standards while maintaining traditional style, creating the perfect balance of modern comforts and nostalgic ambience. 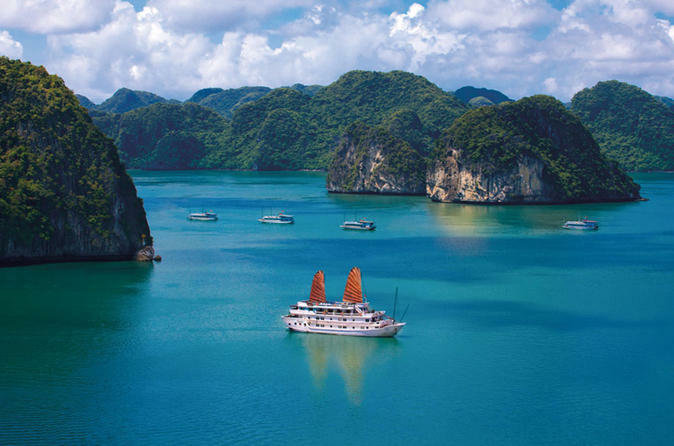 Explore Halong Bay with Oriental Sails. 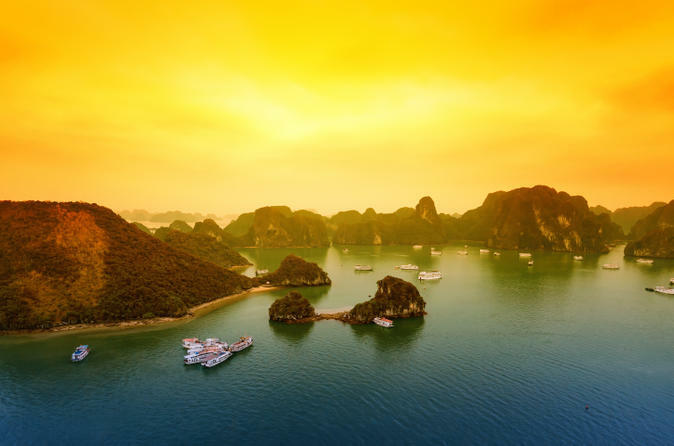 This 2-day cruise provides a packed itinerary to truly get the best from your Halong Bay stay, however you could of course just sit back, relax and enjoy the stunning scenery. Our activities include; cave visits, swimming, kayaking, tai chi and a cooking class. We also offer great dining throughout your stay. 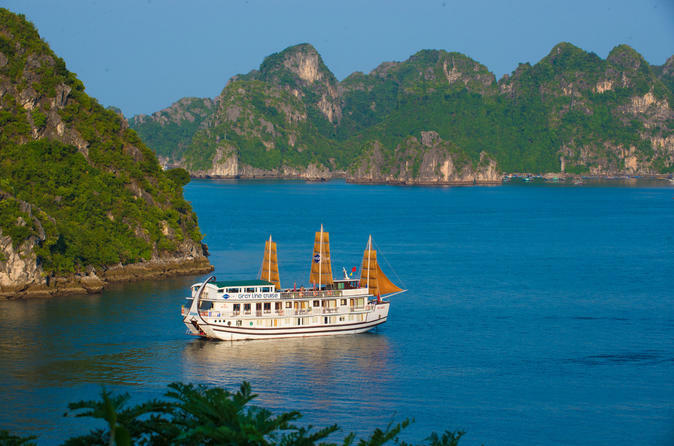 This tour combines an overnight cruise on the world famous Halong Bay as well as a 1-night stay at the Monkey Island resort, with activities Cat Ba Island thrown in for good measure. 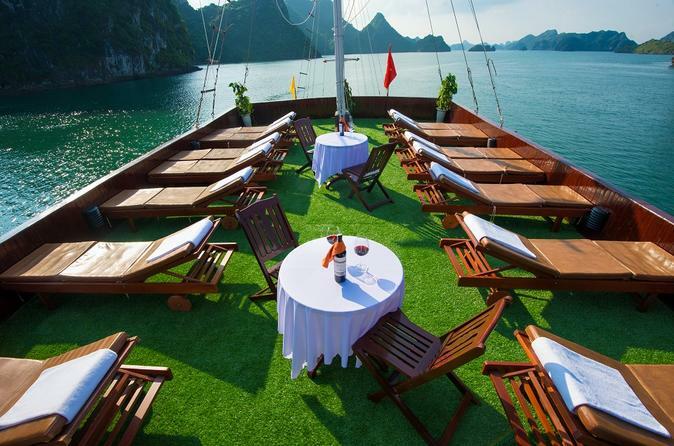 You'll have the opportunity to experience the exquisite sunset and sunrise on Halong Bay, together with the main sights, and also a chance for swimming or kayaking, followed by some time to appreciate the beauty of Cat Ba Island, and then a choice of activities and overnight at Monkey Island Resort. 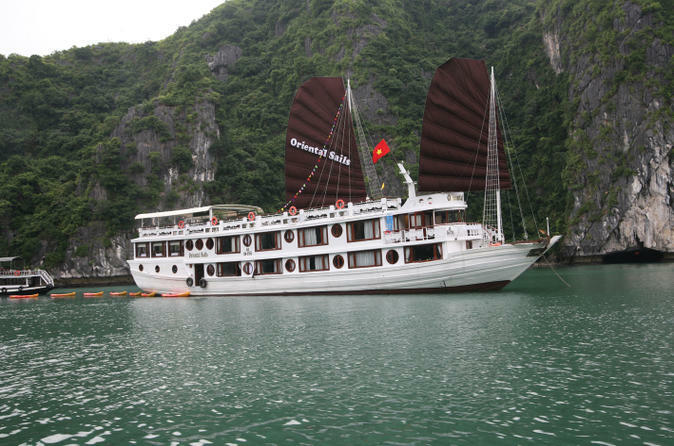 3-Day Halong Bay Cruise plus Mê Cung Cave and Dark and Light Cave. 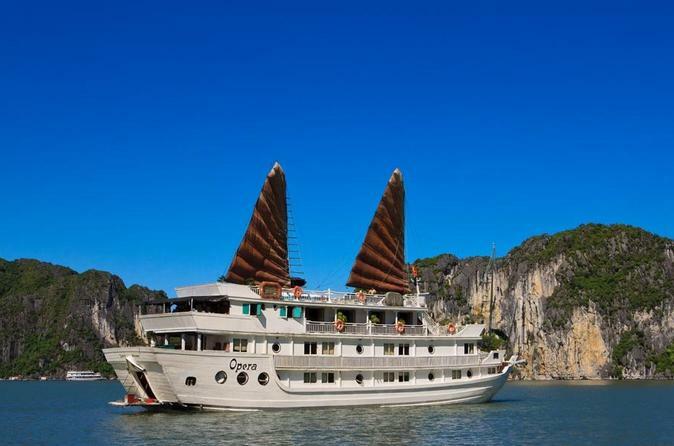 A three day, two night cruise is the perfect way to see the magnificent World Heritage Site of Halong Bay, the more primitive and the isolated Lan Ha Bay. Get a close look at the area’s unique and spectacular limestone formations and caves. Visit white sandy beaches, hidden caves, a typical fishing village, do some kayaking, or just relax. All while enjoying the luxury of your comfortable, fully-equipped cruiser with its well-trained, friendly staff and delicious meals. Witness the amazing stalactite in miraculous forms inside Amazing Cave, one of the largest caves in Halong Bay. We will take you to Lan Ha Bay, one of Cat Ba islands, where you can sit and relax on the beautiful beaches. If you feel more energetic, you can even kayak around the scenic bay. You also have the option to go swimming at Ti Top Island or even hike up for a panoramic view of the bay! This is a fantastic 2 day/1 night Halong Bay trip that covers almost all of the beautiful highlights of Halong Bay, Lan Ha bay and nearby attractions. Tourists will stay in a luxury cabin and experience a level of service that exceeds expectations. Visit an exclusive floating house and experience how life is different compared to the mainland. Learn about their food, their children, their culture, their private fish farms, and how residents earn a living. Discover the Dark and Bright cave, the most amazing place in Lan Ha Bay, by kayak or bamboo boat. Explore Bewitching Grotto or Amazing Cave; one of the most stunning and newest caves in Halong Bay. Embark at Tuan Chau, the most famous Marina Pier in Halong and enjoy free tea at our private lounge.The longer routes extend cruising time, providing guests with more time to discover the diversified landscapes of Halong Bay.